Goran Bogdanovski (Kino Šiška, Slovenia) invited me to present my proposal of a new dance work to dance house partners of the European project modul-dance. He explained me the project and I said yes. The possibility to research, create and tour the piece among the participating houses sounded great. I immediately knew what I want to propose. There was a solo piece I wanted to do for some time now. My debut choreography was a solo, and I felt, that after several collaborative and group projects, the time was right to return to this format. I even had the perfect team in my mind for the work. Meeting of the representatives of all 22 dance houses participating in the project and artists which were invited to present their proposals. Three Days. During the day we had conferences and in the evenings we watched performances at Lyon Dance Biennial. It was great to meet in person all the artists and all the representatives. The construction and goals of the project were presented. All 22 artists shortly presented their work and proposals. Interesting people. There was a little stage with the screen where we saw mainly videos of performances that artists present. The conference hall with a little stage! The idea of talking from behind the desk didn’t appeal to me very much, as the stage is much more the place, which I know and understand. I decide to do my presentation in a format of presentation- performance. This is what I do and what I do best. Good choice. I got some nice offers for creating my new work. What I liked the most was that after the presentation we (the artists) had our own desks where presenters could come to meet us and to show their interest. A new edition of the Festival International CDC-Des Migrations will take place in Toulouse very soon. From the 2nd to the 19th April, 17 artists will present their works at one of the 8 venues participating. Its interesting artistic program includes four shows developed under the umbrella of the modul-dance project. Hooman Sharifi will present Then love was found and set the World on fire. The piece derives its visual expression from the videos posted on the Internet which documented the popular revolts ocurred in Iran in 2009. 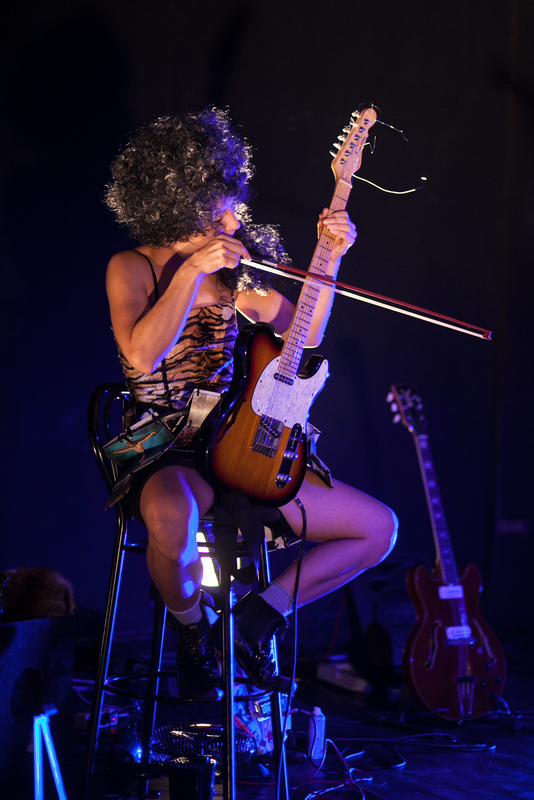 Magali Milian and Romuald Luydlin will premiere Spekies, an approach to shape and premonition that they lead in the company of a guitar-player and the author of modern detective stories, Caryl Férey. Pausing is the title of the project developed by Ioannis Mandafounis and May Zarhy. It moves between dance and physical movement, imaginary scenarios and slices of reality creating an intimate spectacle. Eugénie Rebetez and her one-woman show entitled Encore blend song, dance and humour to create a unique language. Rebetez goes against trends and performs in a light-veined and cheeky register. Sofia Dias & Vítor Roriz, 2012 modul-dance selected artists, will perform a previous work, Fora de qualquer presente, a disturbing blend of precise writing and choreography which builds progressively using onomatopoeic gestures. In their universe, time goes backwards and the body follows this fleeing motion.